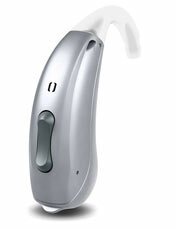 Rexton Hearing Aids - Rexton has been in the business of helping people hear for over 50 years. Rexton has focused on four key ideas when developing their products; value, innovation, quality, and usability. Rexton products have very good reliability performance and longevity. We have found that they have a very good balance of value, quality and reliability. Rexton is a subsidiary of Signia Siemens hearing aids. There are some similarities for economic reasons such as case design and accessories, but they are not rebranded or copies of Signia Siemens hearing aids. Rexton has its own exclusive technology direction and it is different from Signia Siemens hearing aids. In fact, the software used by a practitioner to program Rexton hearing aids is unique. Rexton hearing aids have been positioned in the mid to upper mid range in technology. Northwest Professional Hearing - Why choose us? We provide an uncommon level of professional services and long-term support that is included in our low prices. We are not just a website we are a family owned "Bricks and Mortar" practice that has been achieving excellent patient satisfaction since 2003. We only offer name brand products and quality hearing aids that are an approved medical treatment for hearing loss. See Our Reviews on Google. Rexton Hearing Aid Prices and Information - Is listed by technology then by hearing aid style along with prices for each technology level. The list includes Rexton's latest MyCore technology. The next category is TruCore which is being superseded by MyCore technology. 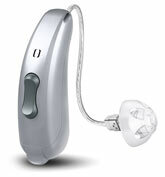 Prices are listed for each hearing aid, technology level and the associated accessories. Our Rexton prices are significantly discounted. MyCore 8C Technology a seamless combination of natural sound and direct streaming. Rexton's new MyCore platform combines the best of two worlds. Direct audio streaming from iPhone and advanced binaural signal processing that allows wearers to hear more comfortably and naturally. With the new feature, My Voice, which allows wearers to hear their own voice naturally. MyCore 8C technology is available in both RIC and BTE models. Wearers can now enjoy a truly individualized hearing experience. Emerald S 8C is a Receiver In the Canal (RIC) hearing aid with a size 312 battery. The size 312 battery provides for a slimmer case. It has direct connection to the iPhone and connection to Android via the Smart Mic. The user can take calls and listen to music directly into the Emerald S 8C. With the Smart Transmitter the user can listen to TV in Dolby Digital stereo sound. Using the Rexton Smart Direct App with the Rexton Emerald S 8C you can control the features. A Receiver In the Canal (RIC) hearing aid is smaller than traditional Behind the Ear (BTE) hearing aids. The Emerald S 80C has 48 channels, 6 memory areas for programs. Price: $1,195.00 ea. The Emerald S 60C has 32 channels, 6 memory areas for programs. Price: $1,095.00 ea. The Emerald S 40C has 24 channels, 6 memory areas for programs. Price: $995.00 ea. Prices above are for one hearing aid. Emerald M 8C is a Receiver In the Canal (RIC) hearing aid with a size 13 battery. The size 13 battery provides for approximately 30% more battery life than the 312 battery. It has direct connection to the iPhone and connection to Android via the Smart Mic. The user can take calls and listen to music directly into the Emerald M 8C. 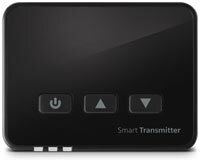 With the Smart Transmitter the user can listen to TV in Dolby Digital stereo sound. Using the Rexton Smart Direct App with the Rexton Emerald M 8C you can control the features. It has and the option of a T-coil for loop hearing systems. A Receiver In the Canal (RIC) hearing aid is smaller than traditional Behind the Ear (BTE) hearing aids. The Emerald M 80C has 48 channels, 6 memory areas for programs. Price: $1,195.00 ea. The Emerald M 60C has 32 channels, 6 memory areas for programs. Price: $1,095.00 ea. The Emerald M 40C has 24 channels, 6 memory areas for programs. Price: $995.00 ea. 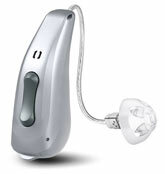 Mosaic M 8C BTE is a traditional Behind the Ear (BTE) hearing aid with a size 13 battery. The size 13 battery provides for approximately 30% more battery life than the 312 battery. It has direct connection to the iPhone and connection to Android via the Smart Mic. The user can take calls and listen to music directly into the Mosaic M 8C. With the Smart Transmitter the user can listen to TV in Dolby Digital stereo sound. Using the Rexton Smart Direct App with the Rexton Mosaic M 8C you can control the features. The Mosaic M 80C has 48 channels, 6 memory areas for programs. Price: $1,195.00 ea. The Mosaic M 60C has 32 channels, 6 memory areas for programs. Price: $1,095.00 ea. The Mosaic M 40C has 24 channels, 6 memory areas for programs. Price: $995.00 ea. Smart Mic offers hands-free operation for Bluetooth enabled devices and sends the sound directly to the users hearing aids. It can be used as a remote control and it can be used as a companion microphone to directly stream live conversations to the hearing aids. Rexton Smart Mic Price: $225.00 ea. 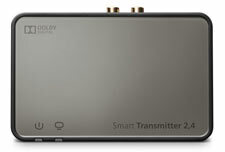 Smart Transmitter 2.4 is a device that connects TVs and streams the audio directly to Rexton MyCore hearing aids providing Dolby Digital sound. TurCore 6C Technology will provide the user with an enjoyable listening experience that is more comfortable and natural than ever before, whether you are in a noisy restaurant, reverberant setting like an auditorium or mall, or even while enjoying a concert. TruCore provides a more natural listening experience with expanded features and technology. The technology includes, Voice Ranger enhances speech in every situation, Music Enhancer maximizes enjoyment of music, Reverb Reducer reduces echo, Bluetooth compatible and IP67 rated. 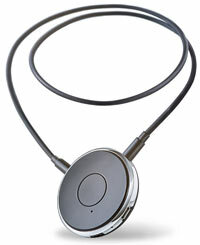 Stellar Li 6c TruCore is a Receiver In the Canal (RIC) hearing aid. It is equipped with a lithium-ion power cell that uses wireless inductive charging. There is no longer any need to worry about changing batteries and buying batteries. There are no charging contacts to align so it's simple and easy to use. Simply place Stellar Li in the charger, and in four hours it will be charged and ready to go. When you take your Stellar Li hearing aids out of the charger they turn on automatically. They stay charged for 24 hours, even if you're using the Smart Connect Bluetooth remote. Nothing stops Stellar Li, so you can tackle your busy day without missing a beat. Available in 80/60/40. Stellar Li 6C is based on Rexton's proven TruCore technology, meaning you will enjoy a listening experience that is more comfortable and natural in a variety of environments. These include noisy restaurants, auditoriums, shopping malls, and even when listening to music. Features include: integrated T-coil, Bluetooth compatibility and IP 68 rated which basically makes it waterproof. The Stellar Li 6 80 TruCore has 48 channels, 6 memory areas for programs. Price: $1,195.00 ea. The Stellar Li 6 60 TruCore has 32 channels, 6 memory areas for programs. Price: $1,095.00 ea. The Stellar Li 6 40 TruCore has 24 channels, 6 memory areas for programs. Price: $995.00 ea. 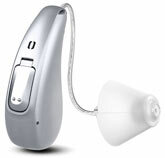 Mosaic HP 6C BTE is a Behind the Ear (BTE) hearing aid with a size 675 battery. It features a rugged, comfortable housing for nearly all hearing needs and wearing preferences. All are fully featured with wireless remote audio streaming and useful apps. Mosaic P and HP are two power models that fit up to profound hearing loss. Features Include: Voice Ranger, Reverb Reducer, Tinnitus Function, T-coil, IP67 rated and is Bluetooth compatible. The Mosaic HP 6C 80 TruCore has 48 channels, 6 memory areas for programs. Price: $1,195.00 ea. The Mosaic HP 6C 60 TruCore has 32 channels, 6 memory areas for programs. Price: $1,095.00 ea. The Mosaic HP 6C 40 TruCore has 24 channels, 6 memory areas for programs. Price: $995.00 ea. Smart Connect is for use with TruCore products. It is discreet, hands-free Bluetooth remote allows you to hear your phone calls in both ears without touching the phone or the need for a separate Bluetooth earpiece. Smart Connect also allows you to stream music, TV, and other audio right into your hearing aids, and doubles as a hearing aid remote control. Smart Transmitter is for use with TruCore products. It is a Bluetooth streaming device that sends audio signals from additional devices, such as TV, directly into hearing aids. Allows you to stream sound from your favorite shows right into your TruCore hearing aids. Smart Key is a discreet, convenient remote control with easy to use buttons. For use with MyCore and TruCore products.